Gionee M2017 is a premium Android phone launched in December 2016. Its main selling point is the massive 7,000 mAh battery and the high quality Italian alligator leather. The Gionee M2017 has a 5.7-inch AMOLED display and a dual camera configuration at the rear. 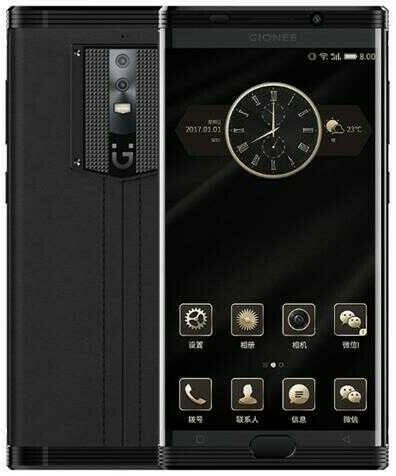 The Gionee M2017 has a high-end design that is driving its high price of 6,999 CNY (about $ 1,010) in China. 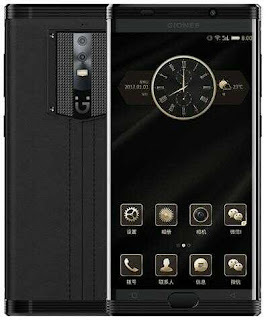 You can also buy an exclusive model with Italian alligator leather for 16,999 CNY (about 2,449 USD) in China. Gionee M2017 has a 5.7-inch AMOLED display with a resolution of 1440 x 2560 pixels. The screen is protected by a sapphire crystal with rounded edges. Above the screen, the Goinee M2017 has an 8-megapixel camera for selfies or video calls. On the back, the Gionee M2017 has a dual camera configuration. A 12 megapixel camera associated with a 13 megapixel camera. The camera supports 2x optical zoom, autofocus for phase detection and HDR. It can also record 4K videos. While Gionee M2017 looks outward like a beacon, choosing a middle class chipset like Qualcomm Snapdragon 653 is a bit disappointing. To compensate (probably), Gionee M2017 comes with 6GB of RAM. The phone is loaded with Android 6.0.1 (Marshmallow). It offers 128 GB of built-in memory without support for memory cards. The Gionee M2017 has two 3,500 mAh Li-Po batteries connected in series to deliver 7,000 mAh. This, according to Gionee offers up to 25 hours of video game. Gionee M2017 supports 4G LTE and will work in Nigeria on MTN, Etisalat, Ntel, Smile and InterC. Gionee M2017 is not yet officially available in Nigeria. It is currently only available in China. At the moment, we have no information on prices and availability for Nigeria, Ghana or Kenya. If available, the Gionee M2017 price in Nigeria should be between 350,000 and 900,000 nairas, depending on your location and model.